Started the morning in my motel room editing more videos and updating the blog, then back on the road. Beautiful weather again (something I’ve been blessed with this whole trip), and more hawk encounters. Late in the day, hit a really bad stretch of road, where the shoulder was extremely narrow and a rumble strip hemmed me in with nowhere to maneuver. Fortunately, it didn’t last too long. Finally rolled into Warrensburg around dinnertime and pulled into a sandwich shop to grab a quick bite to eat before pushing the final 11 miles to the state park campground. As I prepared to pay, a man walked up to me saying he saw me on the highway earlier in the day and he was buying my meal. Thanks, Shane Collins! Then another person walked into the shop and asked if I was the owner of the yellow trike. She said she saw me on the highway earlier and was fascinated with it, and wished I could have seen the looks on all the other drivers’ faces. There’s something really special about this rocket trike to generate this kind of reaction everywhere I go. 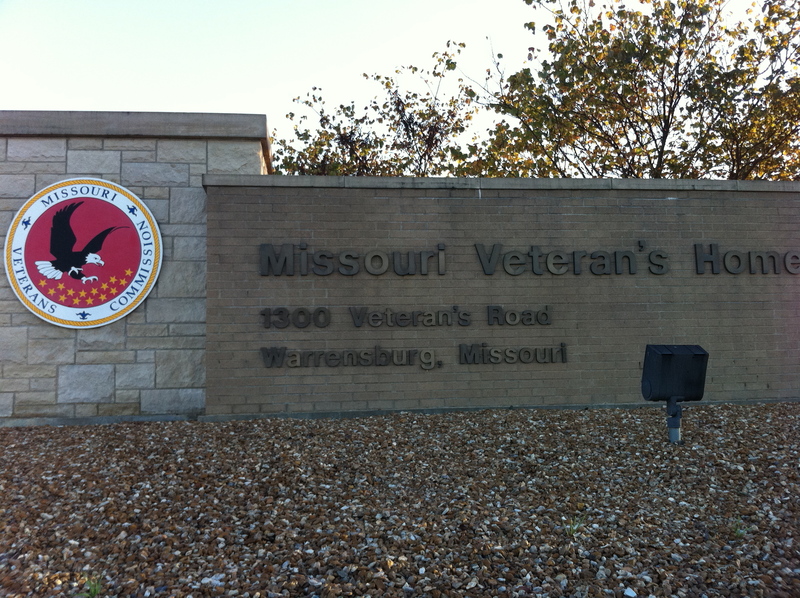 Over dinner, I told Shane and his girlfriend, Kim, that I was hoping to visit the local air force base the next town over, and they asked if I wanted to visit the Missouri Veterans Home. I didn’t know one was here, so they put in a call to the director to see if they could set something up, but he wasn’t available. So I figured I’d just push on while there was still light to ride. Got back on Hwy. 50, and at the next exit saw a sign for the veterans home, felt a strong pull, and made a spontaneous decision to visit anyway, figuring the rocket trike might brighten a few veterans’ nights. I’d figure out where to sleep later. More synchronicity: right after deciding to make for the Veterans Home, my phone rang. It was one of my best friends, Rick Feller (who served his country in the National Guard). So I rolled up to the front door, walked in, and asked if I could bring the trike inside. One of the employees commenced to get on the intercom to announce a “rocket trike is in the lobby, with a guy who’s supporting veterans and pedaling across the country.” What happened next is hard to put in words, but was profoundly moving. Veterans from several different wars started rolling into the lobby in their wheelchairs. I answered a bunch of questions about the trike (which everyone seemed to really enjoy), then had some very special one-on-one conversations with Americans who know the true meaning of sacrifice, thanking each of them for their service to our nation. It’s time for our generation to toughen up. 92-year old Frank Spicer, a World War II veteran, tried to adopt me on the spot, so I could stay overnight in the home’s guest room, but the people in charge weren’t buying it. Before leaving, I had the honor of interviewing Frank, a real American hero. First, he shared his D-Day experiences, then his thoughts on the need for green jobs for veterans. I finally said goodbye, then rode a couple of miles in the dark (not recommended) to a seedy, run down hotel. Had a very strange conversation with the guy at the front desk that I thought might never end, but finally managed to get the room key. Then had to figure out how to fit my trike into a room already crowded with two beds. Thanks to the guy on the cell phone who moved his truck, and to Logan for pitching in without a word to lift the front of the trike over one of the beds. I’m not even halfway through the trip, and have already depleted most of my hotel fund, so hoping I make more campsites from here on in. This entry was posted in 2010 Ride, Blog, Video and tagged missouri veterans home, ride for renewables, world war II. Bookmark the permalink.